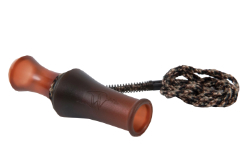 Predators can't resist investigating the natural sounds of the flextone Dying Rabbit Call. The flexible design gives this call lots of inflection and natural pleading sound. Just squeeze the end closed for a quiet whine or release for louder volume. It is a coaxer and long distance call all in one.